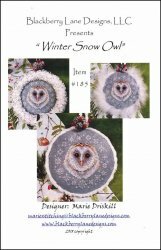 Winter Snow Owl Ornament [H1910] - $12.00 : Yarn Tree, Your wholesale source for cross stitch supplies. A cross stitch pattern by Blackberry Lane Designs. Look at "hoooo" finally arrived! This beautiful barn owl! Decorated around the outer edge of the owl, are small snowflakes. Enjoy the different ways of being able to finish this design. "Owl" you need this winter, is to stitch this design. Stitch count 54w x 55h.